25) Denavit, V.; Laine, D.; Bouzriba, C.; Shanina, E.; Gillon, E.; Fortin, S.; Rademacher, C.; Imberty, A.; Giguere, D. Stereoselective synthesis of fluorinated galactopyranosides as potential molecular probes on galactophilic proteins: assessment of monofluorogalactosides-LecA interactions. Chem. Eur. J. 2019, 25, 4478-4490. 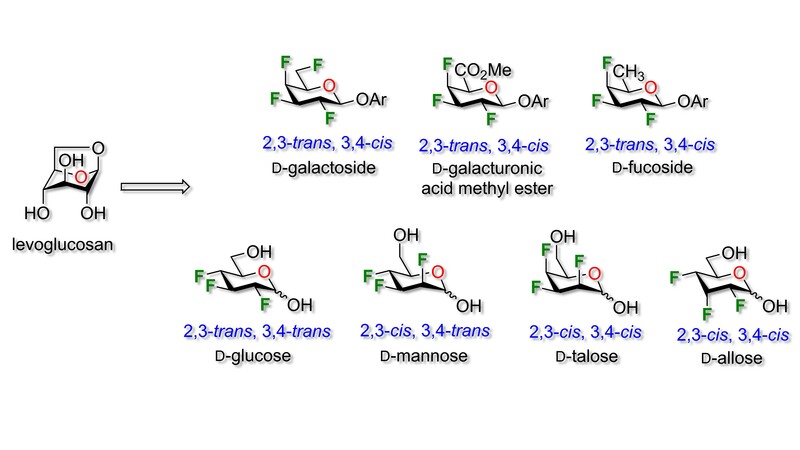 24) Denavit, V.; Laine, D.; St-Gelais, J.; Johnson, P. A.; Giguere, D. A Chiron approach towards the stereoselective synthesis of polyfluorinated carbohydrates. Nat. Commun. 2018, 9, 1-11. 23) Vadhadiya, P. M.; Jean, M.-A. ; Bouzriba, C.; Tremblay, T.; Lagüe, P.; Fortin, S.; Boukouvalas, J.; Giguere, D. Diversity-oriented synthesis of diol-based peptidomimetics as potential HIV protease inhibitors and antitumor agents. ChemBioChem. 2018, 19, 1779-1791. 22) Denavit, V.; Laine, D.; Tremblay, T.; St-Gelais, J.; Giguere, D. Synthetic inhibitors of Galectins: Structures and Syntheses. Trends Glycosci. Glycotechnol. 2018, 30, SE21-SE40. 21) Laine, D.; Denavit, V.; Giguere, D. Synthesis of protected 3-deoxy-3-fluoro- and 4-deoxy-4-fluoro-D-galactopyranosides from levoglucosan. J. Org. Chem. 2017, 82, 4986-4992. 20) Giguere, D. Surface polysaccharides from Acinetobacter baumannii: Structures and syntheses. Carbohydr. Res. 2015, 418, 29-43. 19) Rodrigue, J.; Ganne, G.; Blanchard, B.; Saucier, C.; Giguere, D.; Shiao, T. C.; Varrot, A.; Imberty, A.; Roy, R. Aromatic thioglycoside inhibitors against virulence factor LecA from Pseudomonas aeruginosa. Org. Biomol. Chem. 2013, 11, 6906-6918. 18) Nicolaou, K. C.; Lu, M.; Totokotsopoulos, S.; Heretsch, P.; Giguere, D.; Sun, Y.-P.; Sarlah, D.; Nguyen, T. H.; Wolf, I. C.; Smee, D. F.; Day, C. W.; Bopp, S.; Winzeler, E. A. Synthesis and biological evaluation of epidithio-, epitetrathio-, and bis-(methylthio)diketopiperazines: Synthetic methodology, enantioselective total synthesis of Epicoccin G, 8,8’-epi-ent-Rostratin B, Gliotoxin, Gliotoxin G, Emethallicin E, and Haematocin and discovery of new antiviral and antimalarial agents. J. Am. Chem. Soc. 2012, 134, 17320-17332. 17) Bergeron-Brlek, M.; Giguere, D.; Shiao, T. C.; Saucier, C.; Roy, R. Palladium-catalyzed Ullmann-type reductive homocoupling of iodoaryl glycosides. J. Org. Chem. 2012, 77, 2971-2977. 16) St-Pierre, C.; Ouellet, M.; Giguere, D.; Ohtake, R.; Roy, R.; Sato, S. Galectin-1 specific inhibitors as a new class of compounds to treat HIV-1 infection. Antimicrob. Agents Chemother. 2012, 56, 154-162. 15) Nicolaou, K. C.; Giguere, D.; Totokotsopoulos, S.; Sun, Y.-P. A practical sulfenylation of 2,5-diketopiperazines. Angew. Chem. Int. Ed. 2011, 51, 728-732. 14) Giguere, D.; Martel, J.; Shiao, T. C.; Roy, R. Enantioselective de novo synthesis of 4-deoxy-hexopyranoses via hetero-Diels-Alder cycloadditions-Total synthesis of ezoaminuroic acid and neosidomycin. J. Org. chem. 2011, 76, 9687-9698. 13) Nicolaou, K. C.; Totokotsopoulos, S.; Giguere, D.; Sun, Y.-P.; Sarlah, D. Total synthesis of epicoccin G. J. Am. Chem. Soc. 2011, 133, 8150-8153. 12) Chabre, Y. M.; Giguere, D.; Blanchard, B.; Rodrigue, J.; Rocheleau, S.; Neault, M.; Rauthu, S.; Papadopoulos, A.; Arnold, A.; Imberty, A.; Roy, R. Combining glycomimetic and multivalent strategies toward designing potent bacterial lectin inhibitors. Chem. Eur. J. 2011, 17, 6545-6562. 11) Giguere, D.; Andre, S.; Bonin, M.-A. ; Bellefleur, M.-A. ; Provencal, A.; Cloutier, P.; Pucci, B.; Roy, R.; Gabius, H.-J. Inhibitory potential of chemical substitutions at bioinspired sites of b-D-galactose on neoglycoprotein/cell surface binding of two classes of medically relevant lectins. Bioorg. Med. Chem. 2011, 19, 3280-3287. 10) Andre, S.; Giguere, D.; Dam, T. K.; Brewer, F.; Gabius, H.-J. ; Roy, R. Synthesis of a small glyco-mimetic library for inhibitory activity on medically relevant galactose-specific lectins in assays of increasing bio-relevance. N. J. Chem. 2010, 34, 2229-2240. 9) Giguere, D.; Cloutier, P.; Roy, R. Domino Heck/lactonization-catalyzed synthesis of 3-C-linked mannopyranosyl coumarins. J. Org. Chem. 2009, 74, 8480-8484. 8) Giguere, D.; Patnam, R.; Juarez-Ruiz, J. M.; Neault, M.; Roy, R. Catalytic synthesis of novel 4-C-glycosyl coumarins using a domino Heck reaction/lactonization process. Tetrahedron Lett. 2009, 50, 4254-4257. 7) Giguere, D.; Bonin, M.-A. ; Cloutier, P.; Patnam, R.; St-Pierre, C.; Sato, S.; Roy, R. Synthesis of stable inhibitors of human galectin-1 and -3. Bioorg. Med. Chem. 2008, 16, 7811-7823. 6) Faure, R.; Shiao, T. C.; Lagnoux, D.; Giguere, D.; Roy, R. En route to a carbohydrate-based vaccine against Burkholderia cepacia. Org. Biomol. Chem. 2007, 5, 2704-2708. 5) Bonin, M.-A. ; Giguere, D.; Roy, R. N-Arylimidazole synthesis by cross-cycloaddition of isocyanides using a novel catalytic system. Tetrahedron 2007, 63, 4912-4917. 4) Sirois, S.; Giguere, D.; Roy, R. A first QSAR model for galectin-3 glycomimetic inhibitors based on 3D docked structures. Med. Chem. 2006, 2, 481-489. 3) Beha, S.; Giguere, D.; Patnam, R.; Roy, R. Formation of isoxazoles using cerium ammonium nitrate (CAN): a one-pot synthesis of glycomimetics. Synlett 2006, 11, 1739-1743. 2) Giguere, D.; Patnam, R.; Bellefleur, M.-A. ; St-Pierre, C.; Sato, S.; Roy, R. Carbohydrate triazoles and isoxazoles as inhibitors of galectins-1 and -3. Chem. Commun. 2006, 22, 2379-2381. 1) Giguere, D.; Sato, S.; St-Pierre, C.; Sirois, S.; Roy, R. Aryl O- and S-galactosides and lactosides as specific inhibitors of human galectins-1 and -3: Role of electrostatic potential at O-3. Bioorg. Med. Chem. Lett. 2006, 16, 1668-1672.